When we need to remotely connect the computer by using a secure protected channel, SSH is truly the standard. PuTTy is the most widely used and popularly best SSH client for Windows-based systems as it is user-friendly. But first let’s understand all about SSH. SSH abbreviates for Secure Shell or Secure Socket Shell. It is a network protocol that provides users, mainly system administrators, a better and secure way to access a computer as compared to an unsecured network. The first version of SSH was designed by Tatu Ylönen in 1995. SSH refers to the set of utilities that carry out the SSH protocol. SSH creates strong authentication and encrypted data communications between two computers connecting over an open network such as the internet. SSH is commonly used by network administrators for managing systems and applications remotely, authorizing them to log into another computer over a network, implement commands as well as move files from one computer to another. SSH-2 is the current version of Secure Shell protocols. It was adopted as a Standards Track specification by the Internet Engineering Task Force (IETF) in 2006. But SSH-2 is not compatible with SSH-1. Why PuTTY is widely used for Windows? PuTTY has been in practice for decades now. It has been the best SSH client in the Windows world since it is small in size and can be easily accessed. It manages Cisco Routers, logs into the VPS or Cloud Server which makes PuTTY, the favorite choice of many Network Engineers and server admins for configuring the SSH enabled devices. Besides, it helps to log into another computer, which may be on the same network. The basic program is not secured, however, combining it with SSH adds on authentication and encryption to protect connections across the internet. PuTTY is released under the MIT license which, not only preserves the author’s copyright but also allows any other developer to use the source code (which is publicly available) and develop other software from it. The tool also contains a file transfer facility, which can be secured by adding in SCP and SFTP. But there are tools other than PuTTY which have more features to manage servers over SSH remotely. Since the quality of network software has become quite advanced over the past few years, we have a lot of tools which can overcome PuTTY’s missing features such as its inability to open sessions in tabs. 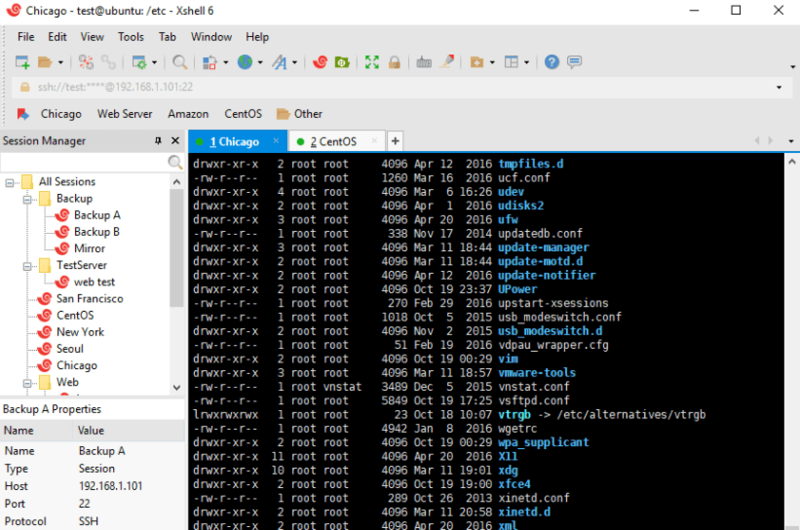 PuTTY is not the only SSH client for the Windows-based system and there is a long list of alternatives that offer even more features and are free to access. Here is the list of few best SSH clients for Windows. There are some of the alternatives to PuTTY which are originally from PuRTY only while there are some of them which are derived from PuTTY but were developed on their own. There is limited Automated Actions/Scripts after login including Line/Character Delays, CR/LF Translations, Timeouts, and Waits for certain variables. Management Hyperlinks/URLs in the session such as Underlining Links, Which browser to Open in and Regex. KiTTY is one of the best SSH clients, an alternative to PuTTY. SuperPuTTY is another fork of PuTTY and aims to develop a better version of PuTTY. It allows tabbed sessions and SCP file transfers between remote and local system. It has a better interface than PuTTY and also requires the original program to be installed and operational. SuperPuTTY’s main disadvantage is that, as it’s updated version of existing PuTTY installation, you have to install PuTTY first. If you are very much used to using PuTTY, PuTTYTray is best Windows SSH client for you. MobaXterm is a single application that runs a ton of functions for programmers, webmasters, IT administrators, and moreover to anybody who is looking to manage the system remotely. 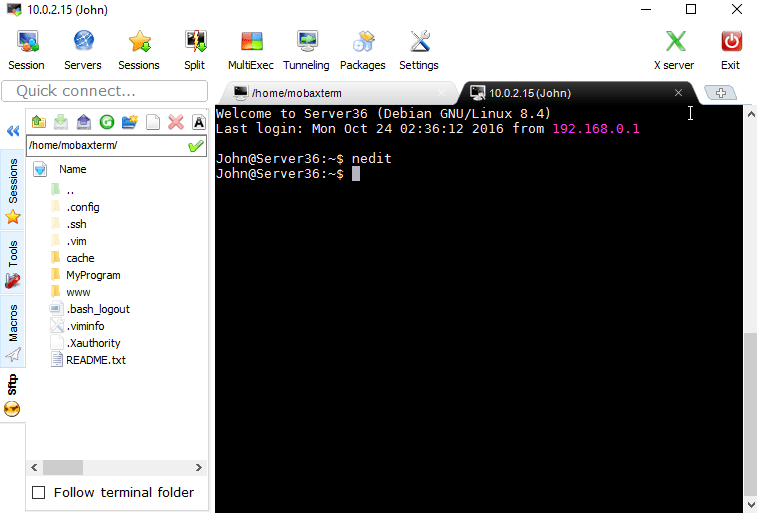 MobaXterm tool works on Windows for free and also supports some Unix/Linux command language. The interface controls the login process to remote computers as well as integrates a file transfer system. Several SSH sessions can be opened, each of which can be accessed using tabs in the interface. The free version allows up to 12 simultaneous sessions, while the paid version has no session limit. mRemoteNG is a branch of mRemote which is open-source, free and remote connection management software. This tool also allows tabbed interface. Also, the tabbed remote connections manager that combines multiple protocols into one application. Xshell runs on Windows is absolutely free for home use but there is a paid version for businesses. However, it can also communicate with Linux and Unix servers. The tool is able to provide you a terminal on to remote computers, also it will store your credentials in encrypted format for frequently-visited servers. It allows multiple connections and you can switch between them, using the tabs that display at the top of the interface terminal window. 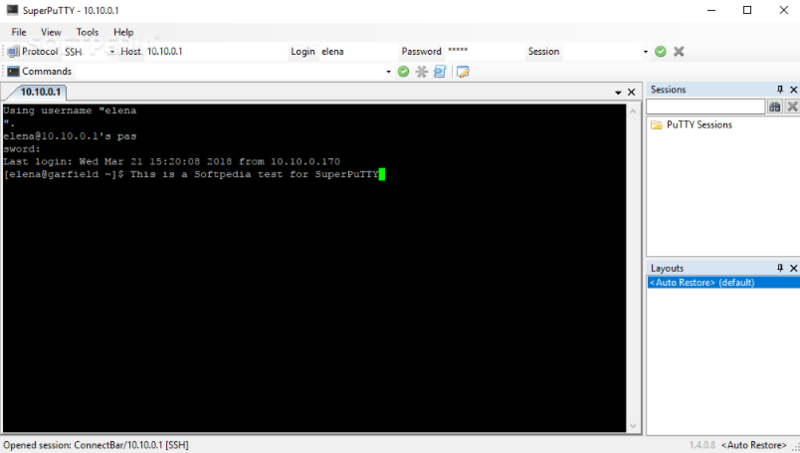 Xshell is another best SSH client tool for connecting to SSH1, SSH2, SFTP, Telent, rLogin and even to Serial connections. The file transfer function that is developed into Xshell operates the SFTP system, which is secure. Bitvise SSH Client is mainly utilized to initiate connections to SSH servers and supports all version of Windows Desktops & Servers. It is usually used interactively, so it runs only when a user runs it, however, it can also be launched unattended to run scripted commands or file transfers, or to maintain an SSH connection for port forwarding. BVTerm, Xterm, and vt100 Terminal Emulation features. It supports RSA, DSA and ECDSA Public Key Auth. Obfuscated SSH w/ an Optional Keyword. It has dynamic Port Forwarding via Socks or HTTP Proxy. It fiils FTP to SFTP Bridge for legacy and old applications/Services. Which One Is the Best PuTTY alternative SSH Client? Usually, it depends on what you’re looking for. If you have been using PuTTY for a long time Kitty is the right choice as it offers the most features and moreover it’s still very PuTTY-like, However, if you want to try non-PuTTY derivative then MobaXterm is the ideal alternative. The above-suggested list of best SSH clients for Windows 10 is not exhaustive at all and you can try and test all of them so that you know with which application you are more comfortable. Also, we hope that this list of best SSH clients outlines a few options you can choose from.